Financier Andrew Umbers - one of the men who helped to arrange the sale of Leeds United by Ken Bates to Gulf Finance House in 2012 - has joined the board at Elland Road. Umbers’ appointment as a club director increases the size of Leeds’ board to seven and follows on from the arrival of Matt Child as United’s chief operating officer last month. Umbers came to prominence in Leeds two years ago when, as director of Eurofin Capital, he advised Bates on the sale of his stake in United to GFH. Eurofin was employed by Bates to find a buyer for his shares and both the firm and Umbers remained involved at Elland Road during GFH’s 16 months as owner, a period in which the bank sought to sell a majority shareholding. 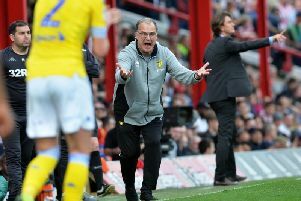 Current owner Massimo Cellino bought a 75 per cent stake from the bank in April of this year and Umbers has acted as an advisor for much of the Italian’s time in charge of Leeds. Cellino has now sanctioned his appointment to the Elland Road board, giving Umbers a remit which will see him focus on the financial side of United’s operations. Umbers joins a list of directors which already included Cellino, the Italian’s two sons - Edoardo and Ercole - and Daniel Arty, Cellino’s American financial advisor. All five represent Eleonora Sport Limited, the company Cellino used to buy Leeds from GFH. GFH, which still controls a 25 per cent stake in United, has two directors at Elland Road. Salem Patel has been on the board since the bank’s takeover in December 2012 while Jinesh Patel, CEO of Dubai-based GFH Capital, was named as a director in July.